Togas are authentic Roman costumes characterized by a loose outer garment, approximately 6 meters in length that is wrapped around the body. These were traditionally worn by Roman men only. While their origin is associated with the Roman and Greek culture, modern togas have become very popular for both men and women due to the ethnic appeal that they bring along. Togas are widely used for shindigs like Halloween, Christmas or even college parties. If you, too have a toga party marked on your calendar and, are wondering how to drape yourself with this authentic Roman robe; then here’s the answer to your question. In this article, we have brought together some simple guidelines for making your toga the ‘DIY’ way. So what are you waiting for? 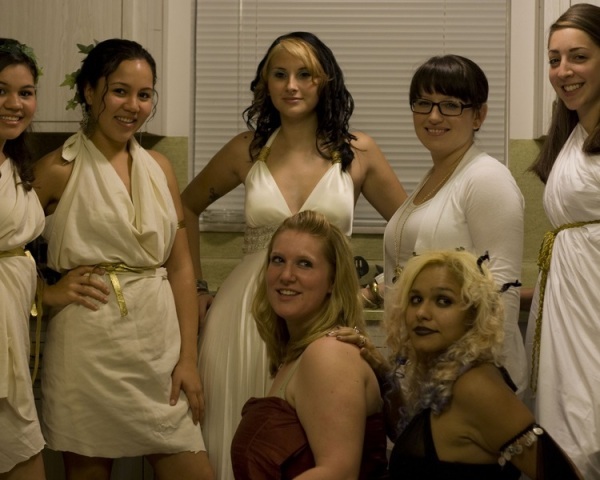 Read through this section on making a toga and double the fun of your toga party. It will be a great idea if you go ahead and add your bit of imagination to it and make it up as you go along. Go for some free flowing fabric for the robe. You may choose colors that best capture the ethnic Roman couture such as white, off white, pearl shade or maroon. Golden robes or one with leopard print can also be tried depending on your choice of shades. Take about 5.5x1.5 meters of the material you have chosen. You may or may not like to wear a t-shirt inside. You have an option of wearing a matching or contrasting topper inside the toga robes. Women may even go for a spaghetti top or a halter neck top inside to come up with a fusion look. Now comes the draping part. Remember, the beauty and grace of a toga depends entirely on how well it is draped and carried. If possible, cut the ends of the fabric into a curved arc for a better wrapping. Wear a pair of shorts to help you in the draping procedure. Take one end of the fabric and pin it on your waistline. Secure it firmly before you move any further because one bad pin-up can ruin all the hard work. Now start wrapping the material around your waist. You may want to wrap the cloth once (or twice in case the fabric is very transparent) and leave some length in buffer. Once the cloth has been wrapped, go ahead and pin it on the side of the waist. This arrangement should be neither too tight nor too loose; in fact it should be just right to allow free movement of your legs. Once you have wrapped it along the waistline, toss the left over cloth on the contrary shoulder from behind; i.e. from right pin up to the left shoulder and from left pin up to the right shoulder. Now bring this around the back of your neck and take it in front. Ensure that the fitting here should be very comfortable and not too tight. Thereafter, pin it to the waist line. Here goes your toga outfit! Women may also like to team up their toga costume with accessories like bead necklaces, metal bangles, anklets and armlets. Men can however, go for a necklace made out of rope or even spartan type sandals. A leafy crown on the head will also add to the zing. Add your own taste and creativity on the accessories front for a more unique look.